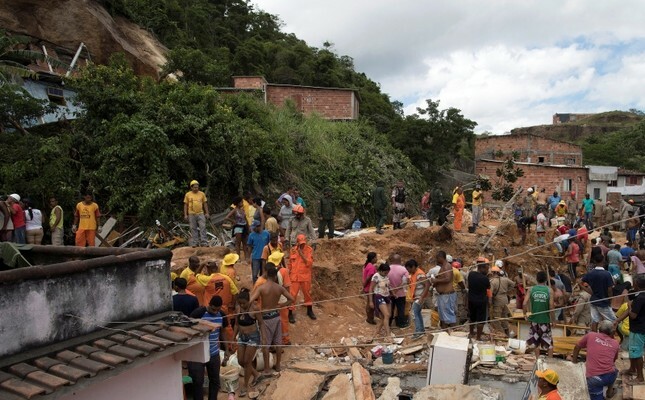 Ten people were killed and 11 injured in a mudslide near Rio de Janeiro on Saturday, Brazilian authorities said. Roberto Robadey, Rio's civil defense department head, told the Globo TV network that the mudslide in the city of Niteroi was caused by heavy downpours. He said people were killed and injured when a large boulder rolled on top of six houses in the Boa Esperanca neighborhood. "It rained a lot over the past two days and a state of alert was declared for Niteroi," he said. "People were advised of the situation and were recommended to move to safer locations." But Claudio dos Santos, president of the Boa Esperanca Residents' Association, told Globo TV that several families "refused to leave." Rescue workers were searching for victims and survivors trapped under the debris and mud. The Rio fire department said the dead included a 3-year-old boy, two elderly women and a middle-aged man. It did not give any more information about the victims. Rosemary Caetano da Silva, a resident of Boa Esperanca, told Globo TV that her 8-year-old granddaughter was buried underneath the rubble. She also said she managed to rescue her grandson who was taken to a hospital.